May, 54, started as chaplain of Hoosier Village, a senior living community in Zionsville, in 2015, where the services are non-denominational. He has been serving different churches as a Lutheran pastor in the Indianapolis area since 1995. He was a chaplain in the Navy Reserves for 22 years from 1990 to 2012. “When I retired, I wanted to stay somewhat connected to the military, so in retirement that usually means staying connected to a veteran community,” said May, who moved to Carmel a year ago. He started to examine ways he could do that. The Martinsville Reporter-Times began running his articles in 2012. May started by interviewing veterans he already knew about from the congregations, focusing mostly on World War II veterans. 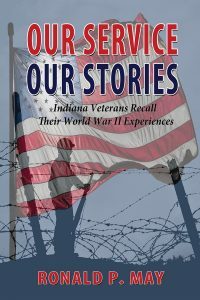 His first book, “Our Service, Our Stories: Indiana Veterans Recall Their World War II Experiences,” was published two years ago. May got involved in Indy Honor Flight, a nonprofit that transports veterans to Washington, D.C. to visit their memorials, in 2012. “That helped me to find out about veterans in the area, offering an interview and writing a service story about them,” May said. In addition, May has written veterans stories for the Hendricks County Flyer. “It’s a labor of love, because the time it takes and distance to drive,” May said. As part of his job as chaplain, May has offered to write stories of Hoosier Village veterans. May is in the process of writing a second book with World War II veterans’ stories. May said he might do a third book on World War II. Then he plans to do a book with a mix of Korean and Vietnam veterans. Many World War II veterans who served in combat weren’t ready to talk about it for a long time. May said some of the most rewarding feedback comes from family members. “They’ll say thanks, we didn’t know this about their dad, grandfather, husband or whatever,” said May, who is single with three grown children, Karlie, 25, Jonathan, 22 and Kristie, 20. May’s book is available at Black Dog Books in Zionsville. 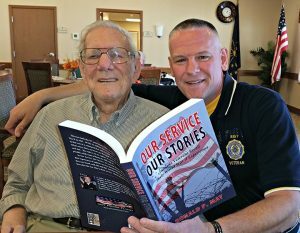 Ronald May, right, included information about World War II veteran Paul Shaerer in his book. May said there are approximately 80 World War II, Korea and Vietnam veterans living in Hoosier Village. May was instrumental in starting a Veteran Garden at Hoosier Village in May. It honored living veterans from Hoosier Village as well as late spouses of residents. Hoosier Village resident Ray McDonald, who turns 90 July 6, is appreciative of May’s contribution. He entered the service in October 1945, just after World War II ended. He served in the occupation forces in Japan in 1946 and 1947. McDonald, who lives at Hoosier Village with his wife, Fro, started a Veterans Club when he moved to Hoosier Village from Fishers nearly five years ago.